Tobacco use is one of the biggest public health threats the world has ever faced. Tobacco kills up to half of all users. There are over 1 billion smokers worldwide and 7 million in South Africa. Research shows that over 70% of smokers would like to give up smoking and the benefits of stopping smoking are almost immediate. So, why don’t more people quit and live healthier more productive lives? The simple answer is that it is not easy to stop since nicotine is highly addictive and smoking is often associated with social activities such as drinking and eating or with psychological factors such as work pressure, stress and fears of weight gain. Healthcraft has developed a smoking cessation service that gives smokers access to an evidence based programme which triples their chances of stopping smoking and of staying stopped when compared to going “cold turkey”. The service is called “GoSmokefree” and encompasses behaviour change techniques, motivational interviewing, face-to-face consultations and pharmacotherapy (medication), when indicated. 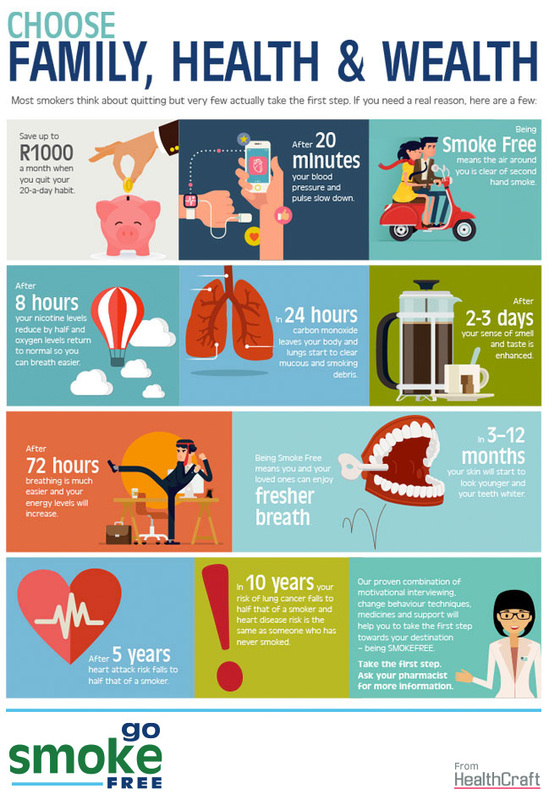 GoSmokefree is supplied by trained healthcare practitioners in accredited pharmacies across South Africa. The GoSmokeFree service is influenced by a long standing approach in the United Kingdom to providing smoking cessation services to the general population specifically through community pharmacies. Statistically, for every two smokers that successfully quit smoking a life has been saved. Look out for these posters at your local community pharmacy.